In a debate of sorts, I found myself not wanting to take part in it. Since I know the Lord has called me into ministry and ordained me as a Minister of the Gospel of Christ as a Pastor. I know without a shadow of a doubt he has. Yet, many denominations do not recognize women in the pulpit. They see just a few scriptures and take man's word for it and stand on it. But there are so many more scriptures that proclaim differently than those very few that many stand on as the Whole Word of God. I see many youtube videos of people proclaiming that others are apostates and preaching the wrong things and maybe they are or aren't but don't take their word for it, look up those scriptures, find out for yourself who God has called. No one is righteous, no not one! We are saved by grace, but once saved/born again, we must work as change agents for the Kingdom. No weapons formed against us shall prosper, all that rise up against us shall fall. This word came up, I had to go in search of what it meant because I had never heard it before. "pastrix (pas • triks) noun 1. A term of insult used by certain unimaginative sections of the church to describe female pastors 2. Female ecclesiastical superhero: Trinity from the Matrix in a clerical collar. What on earth was that noise? A pastrix just drop kicked a demon into the seventh circle of hell! 3. Cranky, beautiful - Saint and Sinner." When we as a church call out our brothers and sisters in the Lord as apostates or other things, we need to make sure we are first hand doing this. If we decide that our denomination is calling out those in the Ministry we need to know for sure that they are really right. I have read much about different women and men pastors being apostates, spreading false doctrine, and more. But how do we know for sure? We have to know the Word of God, each little bit of it, because we sure would not want to slander someone without full and complete knowledge of what they are teaching. We call God a liar when we doubt someone else's call on their lives. All through God's Word, he calls men and women to ministry. It is what HE called me to do not me asking HIM. He placed me in the position, not one I sought. The Bible is clear that God the Creator expresses himself both in males and females. "God created man in his own image . . . male and female he created them" (Genesis 1:27, NIV). The Bible is clear God the Savior offers spiritual redemption equally to males and females. "There is neither Jew nor Greek, slave nor free, male nor female, for you are all one in Christ Jesus" (Galatians 3:28, NIV). The Bible is clear God the Father extends His blessing equally to males and females. "I will pour out my Spirit on all people. Your sons and daughters will prophesy. . . . Even on my servants, both men and women, I will pour out my Spirit" (Joel 2:28,29, NIV). God gives women and men talents and gifts in all areas of life. The Bible is the standard the church follows. 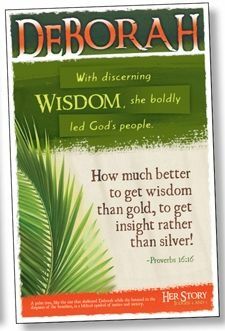 Miriam, Moses’ sister, was a prophetess and leader (Exodus 15:20; Micah 6:4). Deborah was a government leader, spiritual leader, and a wife (Judges 4 and 5). Another woman, Jael, was used of God to fulfill one of Deborah’s prophecies (Judges 4). 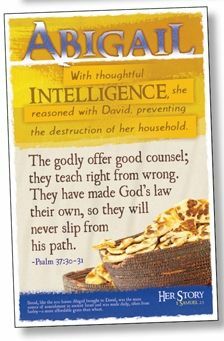 Abigail was a wise and godly woman who influenced David, Israel’s great leader (1 Samuel 25). Huldah was a wife and God’s spokesperson who inspired a national revival (2 Kings 22; 2 Chronicles 34). Job’s daughters inherited their father’s fortunes equally with their brothers (Job 42:13-15). Zelophehad’s five daughters’ inheritance rights were also honored in contrast to cultural tradition (Numbers 36). 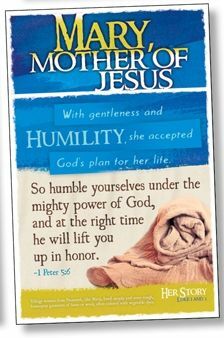 Jesus’ earthly ministry included women; His exhortation to Mary and Martha was to spend time learning from Him (Luke 10:38-42). 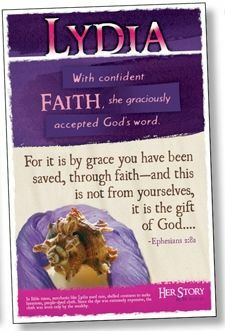 Luke 8:1-3 records many of the women Jesus healed supported Jesus and the disciples "out of their own means" (NIV). Lydia was a Christian businesswoman (Acts 16:13-15). Phoebe was a church leader (Romans 16:1,2). Priscilla was a Bible teacher (Acts 18:24-26). Women who witnessed the empty tomb were the first to proclaim Jesus’ resurrection from the dead (Luke 24:1-10). The example of a godly woman cited most frequently is the Proverbs 31 woman, who was wife, mother, businesswoman, real estate manager, marketer, supervisor, artist, and adviser. God’s Word holds women in high regard. Females and males are together the complete physical expression of God’s image in humanity. God-given gender differences are to be protected and celebrated. God has clearly communicated that neither gender is spiritually or socially superior. "God does not show favoritism" (Acts 10:34, NIV). biblical passages relating to the appropriate role of women in ministry. The passages include Genesis 2:18–25; 1 Corinthians 11:3–12; 14:34–36; Galatians 3:28; 1 Timothy 2:11–15; 3:1–13 . A summary of the four main passages follows. As introduction to the Pauline passages, the position paper notes that ministry in the New Testament is charismatic in nature. It is energized by the gifts (charismata) sovereignly distributed by the Holy Spirit. Restrictions against women in ministry, as advocated by non-Pentecostals who have not accepted the charismatic nature of New Testament ministry, must be closely examined. 1 Corinthians 11:3–12. The statement that "the man is the head of the woman" has long been used to support male superiority and to exclude women from spiritual leadership. Evangelical scholars take one of two positions on the meaning of the word kephale ("head"): (a) "authority over" or (b) "source" or "origin." Both meanings are found in the literature of Paul’s time. The position paper concludes: "Without attempting to resolve this debate, we do not find sufficient evidence in kephale to deny leadership roles to women (in light of biblical examples of women in positions of spiritual authority, and in light of the whole counsel of Scripture)." 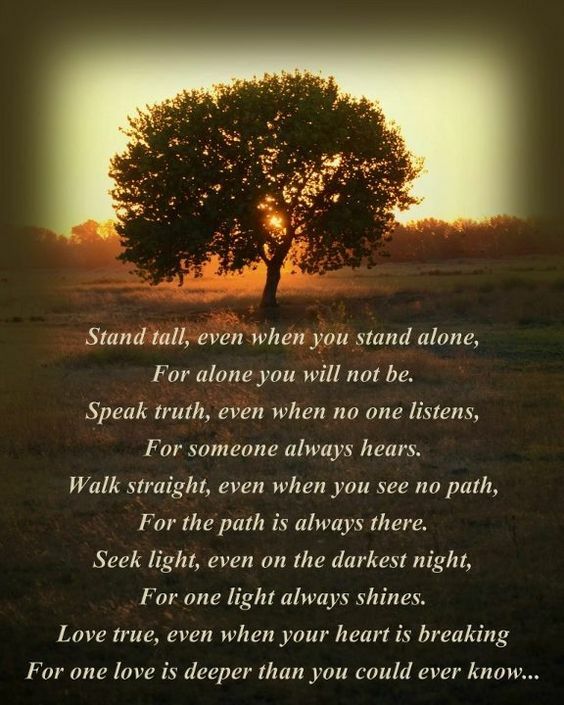 1 Corinthians 14:34–36. When Paul said, "Let your women keep silence in the churches: for it is not permitted unto them to speak," he must have meant something besides an absolute, unequivocal prohibition because he earlier gave instructions to women who prayed and prophesied in public services (1 Corinthians 11:5). Possible explanations of what he was prohibiting include (a) chatter in public services, (b) ecstatic disruptions, (c) certain authoritative ministries, such as judging prophecies, (d) and asking questions during the service. Then the conclusion: "Although we may not solve all the difficulties of this chapter, we do conclude that this passage does not prohibit female leadership, but like the rest of the chapter, it admonishes that ’all things be done decently and in order’ (1 Corinthians 14:40)." 1 Timothy 2:11–15. "I do not permit a woman to teach or to have authority over a man" (verse 12, NKJV) has puzzled interpreters and resulted in various explanations. Was the prohibition a universal truth, or was Paul reporting his application of divine truth for the Christian community to which he and Timothy ministered? There were obvious problems concerning women in Ephesus: immodest apparel and adornment (2:9), younger widows who were busybodies (5:13), and possibly some manipulative women (2 Timothy 3:6). Reading the entire passage beginning with verse 9 strongly suggests that Paul was giving Timothy advice about dealing with heretical teachings and practices involving women in the church of Ephesus. Paul’s choice of "I do not permit" is an echo of his words to the church at Corinth: "But to the rest speak I, not the Lord" (1 Corinthians 7:12). The heresy may have been so serious that Paul had to say, "I am not allowing [Ephesian] women to teach or have authority over a man." 1 Timothy 3:1–13. This passage deals primarily with male leadership, probably because first-century culture produced a primarily male church leadership. Use of the word gunaikas in verse 11 allows translators to choose either "wives" or "women" based on the translator’s assumptions about the context. The first choice applies the qualifications to deacons’ wives, the second to female spiritual leaders. Biblical passages that identify most leaders as male should not be made to say that women cannot be leaders. The Church must work with cultural traditions if it is to fulfill the Great Commission effectively. Concluding that we cannot find convincing evidence that the ministry of women is restricted according to some sacred or immutable principle. We are aware that the ministry and leadership of women are not accepted by some individuals, both within and outside the Christian community. . . . The existence in the secular world of bigotry against women cannot be denied. . . . We acknowledge that attitudes of secular society, based on long-standing practice and tradition, have influenced the application of biblical principles to local circumstances. We desire wisely to respect yet help redeem cultures which are at variance with Kingdom principles. Like Paul, we affirm that the Great Commission takes priority over every other consideration. . . . A believer’s gifts and anointing should still today make a way for his or her ministry. The Pentecostal ministry is not a profession to which men or women merely aspire; it must always be a divine calling, confirmed by the Spirit with a special gifting. Yep, it's long, but with every denomination comes a new set of guidelines that are for women. I have borrowed these passages and articles from a place that we have attended many, many times of the years. The Bible itself displays tension over the issue of women in ministry, and we therefore should not use it as a club to smack down those of differing opinions. Several years ago I saw an old book by J.R. Rice entitled Bobbed Hair, Bossy Wives and Women Preachers. Though I didn't read the whole book, I found out quickly that Rice had an aversion to all three! Of most concern to him was the notion that women would dare consider the possibility of becoming a preacher-pastor. A committee of the Southern Baptist Convention, America's largest Protestant denomination, has recently published its proposed revision of "The Baptist Faith and Message," a confessional statement of the generally held beliefs of those people called Southern Baptists. Under the "Church" section of the proposed revision, the committee sounds a note not unlike that of J. R. Rice: "While both men and women are gifted for service in the church, the office of the pastor is limited to men as qualified by scripture." Assuming that the statement's authors referred to the work of the shepherd- preacher when they used the word "pastor," I have to say immediately that I'm one Baptist who disagrees with this proposed revision. 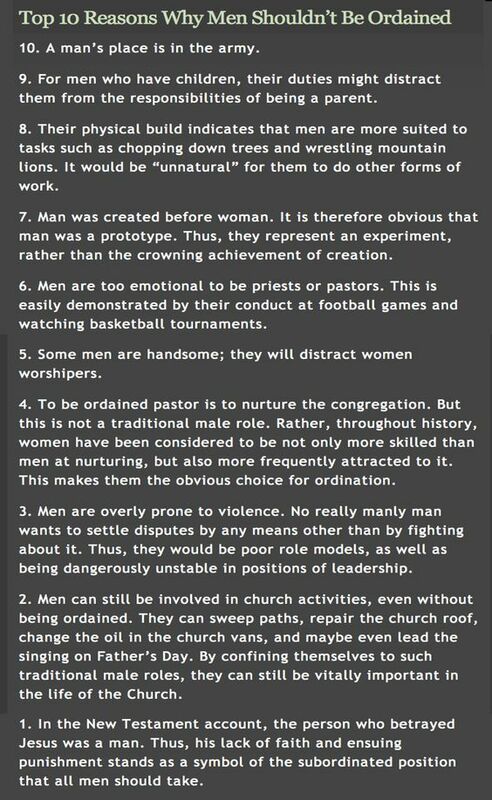 Most importantly, I do so by arguing against the notion that the scriptures don't allow for the possibility of women pastors. Consider this: In I Corinthians 11: 5, the Apostle Paul speaks of prophesying. He encourages men to prophesy with their heads uncovered and women to prophesy with their heads covered. A double point can be made. One, not even the most ardent Southern Baptist demands bonnets in church anymore! But two, and more seriously, "prophesy" literally means "preach" and it refers here to both men and women. Yes, I know that in I Corinthians 14:34, Paul calls for women to keep silent and in I Timothy 2:12 he forbids a woman to have authority over a man. Yet in Romans 16:2, he commands the church at Rome (that included men) to "assist" Phoebe (a woman) in "whatever business she has need of you, for indeed she has been a helper of many and of myself also." Paul ordered the church to do what Phoebe asked! He gives a position of authority to a woman because she had been a "helper" to him. My point? The Bible itself displays tension over the issue of women in ministry, and we therefore should not use it as a club to smack down those of differing opinions. Just as the Bible leaves room for interpretation here, so also should we. I'm not alone in my suggestion that women might be pastor-preachers. Consider three examples. One, Promise Keepers (the movement that called thousands of men to greater commitment to family and church) opened its clergy meetings to women pastors because, as Bill McCartney, founder of the movement, explained, "We have learned that 13 percent of our churches are pastored by ladies." Two, the Reverend Billy Hybels, pastor of the Willow Creek Church, an enormous congregation in Chicago's suburbs known internationally for the "seeker service" trend it started, has said, "We don't restrict any office or position in the church on the basis of gender." Finally, Dr. Billy Graham, when asked by David Frost about women's ordination, said, "Women preach all over the world. It doesn't bother me at all from my study of the Scriptures. And there were many women preachers in the Bible." Each of these three men is a conservative evangelical. Yet, each leaves open the possibility of women as preachers. Ironically, on the same day that the SBC published its proposed revision to the "Baptist Faith and Message," USA Today carried an article about Anne Graham Lotz, daughter of the famous evangelist. In that article, Graham called her the "best preacher in the family." Enough said. Though I respect the right of those in the SBC to state their opinions regarding women, it seems that they're trying to recapture a past age more than they're trying to do a thorough exegesis of scripture. That is not only impossible but unwise. The advancement of women in American culture, yes, even as preacher-pastors, is as inevitable as azaleas at the Masters in April. Yes, we can always debate our Biblical positions (with each of us finding proof-texts to show our rightness). But no astute person can doubt anymore that increasing numbers of churches both inside and outside the shadow of the SBC will ordain women as ministers. That's a reality. To embrace it is to feel the gentle breeze of God's moving Spirit. To reject it is to stand in the face of a swelling tide. The Southern Baptist Convention, meeting in Orlando, Florida, in June 2000, excluded women from the office of pastor. The newly adopted Baptist Faith and Message states that while "both men and women are gifted for service in the church, the office of pastor is limited to men as qualified by Scripture." Where does this leave the Assemblies of God? By permitting the ordination of women and permitting women to pastor, are we tinkering with the words of God? Have we capitulated to the liberal culture by credentialing 5,225 women of our 32,304 credentialed ministers (16.17 percent), and by having 387 women pastors among our 12,055 churches (3.21 percent)? My purpose is not to denounce the Southern Baptists. I have great respect and admiration for what they have done to advance the cause of Jesus Christ. My reason for referring to them is to surface the hard question that is often asked the Assemblies of God. The Southern Baptists, along with some believers inside and outside our Movement, assert that permitting women every role in ministry available to men violates Scripture. As Pentecostals, we better have an answer to that. And, we do. Within this issue of Enrichment is an excellent exegetical article by Craig Keener: "Was Paul For or Against Women in Ministry?" Since Craig deals with the biblical text, I will not retrace his work. However, the approach I take must include the foundational exegetical arguments advanced by Craig, and also by Stanley Horton is his superb article, "Rediscovering the Prophetic Role of Women," as well as Doug Clark’s article, "Jesus and Women." As Pentecostals, we intuitively approach the biblical text in a manner different from most of our evangelical brothers and yes, sisters. We factor in the element of experience as a lens through which we look at Scripture. We are criticized for that. But our evangelical compatriots essentially do the same thing, except they interpret the text from their nonexperience, which is an experience of sorts. I say this with no edge. I’m a graduate of one of the finest evangelical seminaries. I’m grateful for the training I received. Many of my own seminary community side more with us than with the Southern Baptists on the issue of women in ministry. But dialogue is freshened among believers when one can engage from time to time in a little playful poking. I cannot count the number of times I, as a Pentecostal in an evangelical seminary, was accused of basing my views on the Baptism and fullness in the Holy Spirit on my experience. I learned to rejoin: "But you do the same thing. 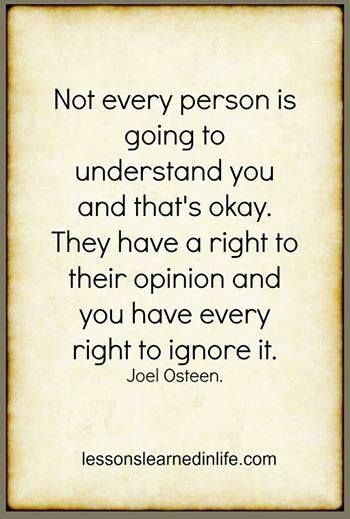 You base your views on your experience. And your experience is that you have not had an experience." I am not so foolish to predicate my hermeneutical approach toward women in the ministry as resting solely on the pillar of experience. I do suggest that experience is a necessary prism through which we understand and appropriate God’s Word. What do I mean? Let me use two examples. This is an astonishing admission. Was Peter absent the day Jesus taught on clean and unclean foods? Several years before Peter’s rooftop experience, Jesus asked: "Are you so dull?…Don’t you see that nothing that enters a man from the outside can make him ‘unclean’? For it doesn’t go into his heart but into his stomach, and then out of his body." Then comes Mark’s tag: "In saying this, Jesus declared all foods ‘clean.’ " (Mark 7:18,19). Do you see the issue? For years Peter had the clear, straight-line teaching of Jesus on the subject of kosher and nonkosher foods; but it took Peter’s experience of the vision to actualize the teaching as applied to his own life. Without the experience at Simon the tanner’s, Peter would have probably lived the rest of his life and never eaten any nonkosher item, even though the Lord had expressly given permission to do so. Look next at Peter’s explanation to the Jerusalem church on the coming of salvation and the Spirit to Cornelius’ house. Peter is up against a traditional interpretation of the Old Testament text as he explained to Cornelius, "You are well aware that it is against our law for a Jew to associate with a Gentile or visit him" (Acts 10:28). Why then did he come? "But God has shown me…." Once the Holy Spirit is poured out on Cornelius, Peter has some explaining to do to the Jerusalem church. He defends himself two ways: (1) the experience itself (Acts 11:4—15), and (2) a biblical text, "Then I remembered what the Lord had said, ‘John baptized with water, but you will be baptized with the Holy Spirit’ " (verse 16). On the basis of the conjuncture of experience and Scripture, Peter rests his case and the Church makes the proper conclusion (verses 17,18). Had the Lord left it to the Early Church to engage in theological debate concerning whether or not the Old Testament text permitted an observant Jew to visit a Gentile’s house–or the inclusion of Gentiles into the family of God without circumcision or maintenance of the ritual law–the issue would have been argued until the cows came home. The Holy Spirit simply chose to take initiative and decide the matter by fiat, and then leave it to the Church to attest His work by reference to the written Word. This provides for us a clue concerning how to adjudicate an issue such as women in the ministry. Is it possible that, in addition to looking at the biblical text, we should survey what the Holy Spirit is doing within the experience of His people? General Superintendent Thomas F. Zimmerman: "A river is designed to flow within banks. For Pentecostals, experience is the river, but that river must stay within the God-ordained banks of Scripture." However, a key perspective has often been lost when Bible believers divide on a doctrinal issue: What does the Bible itself teach us concerning the method by which the Early Church resolved doctrinal differences? It is that method I am looking for; this shapes my hermeneutical approach to the text. I have presented an opening example from the biblical text itself. Had it been left to the Jerusalem church to debate from the Old Testament on whether Peter should be given permission to go to Cornelius’ house, and whether these Gentiles should be received into the community of faith and baptized without being circumcised, I don’t think there would be too many who would deny that the Jerusalem church would have banned the visit. The Holy Spirit, though, acted unilaterally in taking the initiative, in keeping with the Lord’s promise that when the Spirit came, He would lead into all truth (John 16:13). Is the example of Peter and Cornelius an aberration, or is the same principle repeated again? The answer to the last part of the question is a clear and resounding yes. Look at the Jerusalem Council, recorded in Acts 15. They were no longer dealing, as with Cornelius, over the inclusion of one Gentile family into the Church. The Early Church was dealing with the inclusion of entire Gentile communities resulting from Paul and Barnabas’ first missionary journey. A good segment of the Jerusalem church is upset. Why? Because they feel the text of the Old Testament is violated. The group for Gentile inclusion feels otherwise. How do you resolve an issue when both groups have a very high view of Scripture? Does the Assemblies of God have any less high a view of Scripture than the Southern Baptists? No. Our Statement of Fundamental Truths begins by affirming, "The Bible is our all-sufficient rule for faith and practice." The first article relates to the Scriptures inspired: "The Scriptures, both the Old and New Testaments, are verbally inspired of God and are the revelation of God to man, the infallible, authoritative rule of faith and conduct (2 Timothy 3:15—17; 1 Thessalonians 2:13; 2 Peter 1:21)." The Jerusalem Council provides a paradigm for resolving a textual dispute among believers over doctrine. First, there is a full-scale discussion of the issue. The Judaizers led with their thesis, "The Gentiles must be circumcised and required to obey the law of Moses" (Acts 15:5). In the "much discussion" that followed (verse 7), the believers who belonged to the party of the Pharisees probably quoted volumes from the Old Testament text supporting their position. While teaching a college-level course on Acts, I once set aside a class session for the students to role-play the Jerusalem Council. Some students were assigned to play the role of the Judaizers; others, the pro-Gentile party. A student assumed the role of the moderator, James. Two other students played the roles of Barnabas and Paul. A very lively discussion followed. I noticed one thing through the reenactment–something I should have known earlier, but hadn’t really paid attention to it. The weight of the biblical text was on the side of the Judaizers. The role-playing Judaizer students quoted Scripture by the yard in advancing their view of "be saved and be circumcised," or "no circumcision, no salvation." In fact, if you stack up all the texts supporting circumcision on one side of the scale, and the texts affirming inclusion of Gentiles without circumcision on the other side, the Judaizers clearly had the scales tipped in their favor. However, since the Scriptures cannot be broken (set against each other), it became the task of the Jerusalem church–and it is ours today as well on other matters–to harmoniously resolve texts that appear to be contrarily engaging each other. The "much discussion" of Acts 15:7 dealt first with the question, What does the text of Scripture say? The Judaizers answered one way; Paul and Barnabas the other. How do you affirm truth when believers are throwing texts at each other? Here is where the Jerusalem Council has a most important lesson for us–and it’s the same lesson discussed above regarding Peter’s going to Cornelius. We must listen to the experience of seasoned leadership who give testimony to being guided by the Holy Spirit. Following the textual debate, Peter stood and recounted his testimony of years earlier with Cornelius at Caesarea. His clinching line is, "God, who knows the heart showed (italics mine) that he accepted them by giving the Holy Spirit to them, just as he did to us" (verse 8). Peter quoted no Scripture; he simply restated his experience. Then Paul and Barnabas stepped to the microphone. They too spoke of their experience. "The whole assembly became silent as they listened to Barnabas and Paul telling about the miraculous signs and wonders God had done among the Gentiles through them" (verse 12). The Judaizers have no testimony to share. Their arguments are based solely on proof texts, and they totally ignore what the Spirit has done. James, presiding at the Council, drew a conclusion supported by those assembled. He affirmed the testimony of Gentile inclusion and attested it by reference to key texts from Amos 9:11,12 and Isaiah 45:21, pointing to the ingathering of the nations and God’s eternal plan for such (Acts 15:16—18). The essential matter decided, four conditions are laid down for Gentiles to follow (Acts 15:19—21) as essential either for moral purity (abstain from sexual immorality) or table fellowship between Jews and Gentiles (food offered to idols, strangled meat, and blood). Why is this discussion on the inclusion of the Gentiles relevant to the issue of women in the ministry? Because we learn from the New Testament itself the process by which the Early Church resolved issues when texts appeared to collide. Their understanding of the text was impacted by their experience in the Spirit. Let me cite some examples from my own Pentecostal roots. I spent some of my early years growing up in northwest China. The women sat on one side of the church, and the men on the other. The educational level of the women at that time was considerably less than that of the men. Married women called out across the sanctuary to their husbands, seated on the opposite side, with questions related to what was being said or done in the service. That experience helped me put into context Paul’s admonition that women should remain silent in the churches, asking questions of their own husbands at home (1 Corinthians 14:34,35; 1 Timothy 2:11,12). Clearly, he had not forbidden them to speak within the context of prayer or prophecy (1 Corinthians 11:4,5). My experience shaped my understanding of the text. It was no different in regard to women preachers. My mother was ordained by the Assemblies of God in 1924–as were a host of other women in the early years. I grew up listening to my mother and other women preaching the gospel. What was their basis for so doing? The Holy Spirit had called them in light of the prophetic promise of Joel 2:28—30 fulfilled in Acts 2:17,18–in the last days God would pour out His Spirit on all flesh, including daughters as well as sons who would prophesy, including women as well as men servants. In Peter’s sermon on the Day of Pentecost, he announced that God had launched the fulfillment of that promise. It’s not surprising, therefore, that the Pentecostal church has always embraced women in ministry–since to do such is Pentecostal. It’s what the Spirit promised to do in the age before the coming of the Lord. 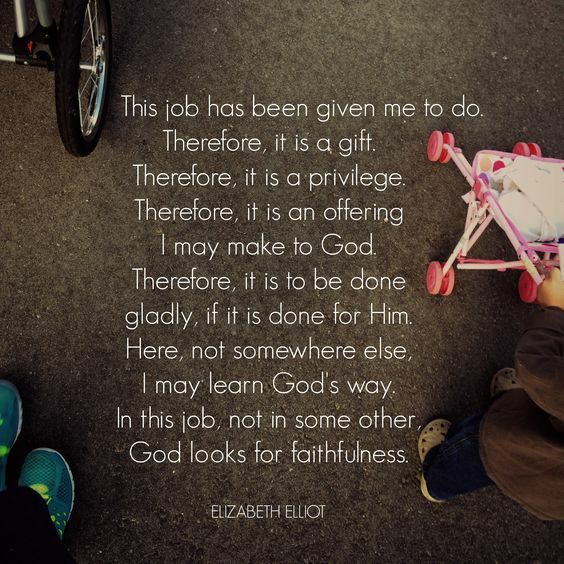 God is an equal opportunity employer; therefore, so must we. When texts have been thrown against us–such as 1 Corinthians 14:34,35 and 1 Timothy 2:11—15–our experience told us that these texts must be interpreted in light of Joel 2, Acts 2, and Galatians 3:28, "There is neither Jew nor Greek, slave nor free, male nor female, for you are all one in Christ Jesus." This is the same pattern we find when dealing with the Gentile inclusion question. Had the issue been presented for debate prior to Peter’s going to Cornelius’ home or prior to Paul’s Gentile mission, the Jerusalem church would have voted against both endeavors of bringing in the Gentiles without prior observance to Jewish law and culture. But the debate took place after the endeavors of Peter and Paul–and their experience helped the Early Church reach an appropriate understanding of the text. With the advent of the modern Pentecostal movement in 1901, the Holy Spirit began to be poured out copiously on both men and women. Six of the 12 elders at the Azusa Street mission were women. They granted credentials and laid hands on believers to go forth as missionaries and evangelists. At the organizational meeting of the Assemblies of God in 1914, women were granted the right of ordination as evangelists and missionaries, but not as elders. Ordained women were, at first, not permitted to vote in the General Council since such was regarded as an eldership function. However, women were accorded voting rights beginning with the 1920 General Council, the same year the 19th Amendment was adopted which granted women in the United States the right to vote. The ban on eldership meant that ordained women should not serve as pastors, marry people, and administer the ordinances of water baptism and the Lord’s Supper. However, the Assemblies of God had ordained women fulfilling all these functions anyway. In 1922, then general superintendent E.N. Bell, writing on behalf of the Executive Presbytery to ordained women, wrote: "It has nevertheless been understood all along that they could do these things when some circumstance made it necessary for them to so do…. The Executive Presbytery… authorized the Credential Committee to issue new credentials to all our ordained women who are actually preaching the Word just the same as ordained men do, and that these new credentials should state these women are authorized to do these things when necessary." So sensitive and potentially divisive was that decision that Brother Bell requested at the end of his letter to ordained women: "TAKE NOTICE: This letter is not to go out of your personal possession." In 1935, the General Council itself recognized that ordained women may pastor and administer the ordinances of the Church. If the Early Church took a few years to sort out the Gentile inclusion issue, it is not surprising that we took a few years at the beginning to work through the issue of women’s inclusion in ministry. I referred earlier to Galatians 3:28 as providing a pattern to help us understand the text and experience brought to bear upon the text. Galatians 3:28 deals with three great cultural divides: (1) Jew and Gentile, (2) slave and free, (3) men and women. As regards salvation, the distinction between each of these was clearly abolished from the start of the Church. Salvation was equally available to both Jew and Gentile, slave and free, men and women. As regards status, the Holy Spirit worked developmentally within the Church as it became a model to the outside unbelieving world. For example, the first issue the Spirit tackled from Galatians 3:28 was the Jewish/Gentile issue. Gentiles were to be included without first becoming Jews. However, to accommodate cultural sensitivities of believing Jews, the Gentiles were told not to eat blood or things strangled. Over time, how an animal was killed or whether a person ate his steak rare ceased to become an instrument of division. The meat issue constituted a temporary, but not a permanent concession to cultural sensitivities. The second issue related to slaves and free. Within the church there was to be no distinction between master and servant–each was equal at the foot of the Cross. However, as an accommodation to culture and to prevent massive social upheaval and persecution of believers–slave and free–the full-scale liberation of slaves was not advocated. Slaves were to be obedient to their masters (Ephesians 6:5—8; Colossians 3:22—25; Titus 2:9,10; 1 Peter 2:18—20), even more so to their believing owners (1 Timothy 6:1,2). Surely no one now would advocate the foregoing texts as an argument for slavery today. We recognize these texts as interim until the full force of Galatians 3:28 could be applied. The gospel is like tree roots growing underneath the sidewalk. Sooner or later, the liberating power of the gospel–for Gentiles, slaves, and women–breaks through the repressive concrete of cultural mores and norms that discriminate and oppress. The third issue of Galatians 3:28 relates to "neither…male nor female, for you are all one in Christ Jesus." Our evangelical friends who are opposed to the ordination of women or women as pastors agree with us that Galatians 3:28 clearly makes salvation available without distinction to each of the three groupings listed by Paul. They agree with us over the status issues of Gentiles and slaves. For example, no one would argue that we interpret Galatians 3:28 in light of the slave passages listed above. We interpret Ephesians 6, Colossians 3, Titus 2, and 1 Peter 2 in light of Galatians 3:28. Neither Gentile nor Jew, neither slave nor free–that is the permanent and enduring law of the gospel as related to both salvation and status. Why are women left out? Arguing that Galatians 3:28, in regards to the status of women, should be interpreted in light of 1 Timothy 2:11—15 is no different than arguing that Galatians 3:28 should be interpreted by the slave passages. Parenthetically, why do our Southern Baptists friends–and other evangelicals who agree with them–not equally insist on the enforcement of the veil (1 Corinthians 11:3—6) along with the enforcement of "silence" for women? Why this selectivity in the text? By their own hermeneutic, wouldn’t this failure to enforce the veil amount to a capitulation to "liberal culture" and "tinkering with the words of God"? In the end-time harvest, Pentecostals believe that God is accepting all workers and qualifying them for any role consistent with their calling and gifting. My estimation, historically, of how we arrived at that view is that in our early days we witnessed that the Spirit himself had called women into the ministry. Like the Bereans (Acts 17:11), we immediately went to the text to see if this experience could be corroborated. Our forefathers found the eschatological texts of Joel 2, quoted in Acts 2; and the salvation/status text of Galatians 3:28. They understood that God was bringing Pentecost again to the Church to gather in the harvest at the end of the day. In this era of the Spirit, the harvest was so huge, both men and women were needed. Their inclusion of women into the ministry followed exactly the same pattern used by the Early Church, as recorded in Acts. They brought their experience to bear on the text; they brought the text to bear on their experience. And they found a complete consistency between the written words inspired by the Spirit and the present-day leading of the Spirit. Now, with almost 100 years of experience, we can say without hesitation that God’s calling, equipping, and effectively using women in ministry "seemed good to the Holy Spirit and to us" (Acts 15:28). GEORGE O. WOOD, D.Th.P., is general superintendent for The General Council of the Assemblies of God, Springfield, Missouri. Here is another article I found to support women in the Ministry as Pastor's. These leading ladies share their thoughts on what feminism means in a religious context. In her book, Jesus Feminist: An Invitation to Revisit the Bible’s View of Women, author Sarah Bessey writes about the stereotypes that the word feminism carries for some within the church, particularly within evangelical traditions. “In some circles, using the word feminist is the equivalent of an f-bomb dropped in church — outrageous, offensive,” she writes. Although it’s been mistakenly labeled as a movement that derides motherhood, marriage, and homemaking, for Bessey, feminism is about returning to the roots of her faith — to Jesus’ ministry. Women played an important role in the earliest days of Christianity. The Jesus of the Bible spoke directly to women and refused to treat them differently from men. The gospels portray them as disciples during Jesus’ ministry and the first witnesses of the resurrection. They’re mentioned in Paul’s letters as the leaders of house churches and missionaries in their own right. Over the centuries, this fluidity in gender roles slowly faded away. Branches of Christianity that allowed women to act as leaders were declared heretical. According to New Testament scholar Karen King, earlier texts that showed evidence of women in leadership were eventually erased or even rewritten. But that didn’t stop women from making their presence known within the church, and not just as saints. Christian women were preachers, abolitionists and suffragists. They wrote music and founded churches. Although they didn’t always have the support of mainstream churches, they were willing to disturb the status quo to stand up for what they believed was right. As we wrap up Women’s History Month, HuffPost Religion asked a diverse array of Christian women to share what the word “feminism” means to them and what it could mean for the church. Some women said that they believed that Christian feminism is about acknowledging women’s equality before God, while other women chose not to identify with the term, and pushed back with the idea that the feminist movement doesn’t take the experiences of women of color into account. Scroll down for a few women’s responses and add your own in the comments below. I chose this article in part because of the voices of women from different places but whom believe they were called and chosen. Some of the denominations believe that women should not be Pastors but I believe that the Bible does dispute this in so many ways. In a time when Women were not to be in charge of anything, God placed Deborah as a Judge in the book of Judges. She was a strong women and ruled men. Abigail was the wife of Nabal; she became a wife of David after Nabal's death. Abigail is David's third wife, after Saul's daughter, Michal, whom Saul later married to Palti, son of Laish when David went into hiding and Ahinoam. 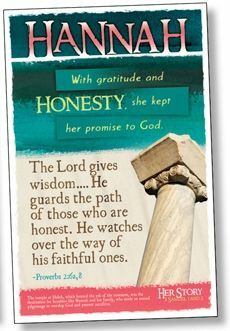 Abigail, a Woman of Integrity The story of Abigail in the Bible (1 Samuel 25) is a story of one of the most faithful and honorable women mentioned in God’s Word – definitely a woman of integrity! So, why would God not call women to ministry when he already has all throughout His Word. God placed the Woman at the Well (Photini) to spread the Gospel of Jesus. God placed Mary to be Jesus' Mother. 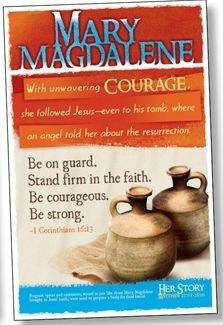 Mary Magdalene to show others Jesus Heals. Esther saved a nation and taught her husband to listen to her, he respected her. Priscilla and Aquila, Priscilla had a home church and taught over men. Mary and Martha had church in their home, Jesus taught, but Martha and Mary were there as well. They witnessed to His Greatness throughout the Land. So, why in the World would Paul's words to Timothy overrule God's redeemer to just men? Why can mom's be mom's to boys teaching them the way they should go, but they can not teach over men in the church. Also, how in the God's Name can so many be against God's Call on Women in the Ministry/Pulpit when all throughout HIS WORD, He has called the unlovely, the unsaved, the untaught, the women of everyday life to Spread the Word of God? Out of two verses and Eve's decision to eat an apple, in which her husband Adam was right there and could have stopped her by throwing the fruit and stepping up! He didn't! He allowed it! So, that point that because Eve sinned and choose to disobey throws out to the sea of endless arguments. Both sinned, both had to leave the Garden of Eden. We all sin and fall short of the Glory of God. Men and Women. However, God's call on each of our lives doesn't change. He calls and does not take back. When denominations are feuding against the Word of God because one believes something a bit differently, they see the scriptures in different light, is it Man's Light or God's Light that the scriptures are seen in? Is it Man's Word or God's Word that is brought out of darkness and into His Light? Throughout History, someone has always pushed women back down even when God's Word and God has brought them out of the darkness of Man's thinking. 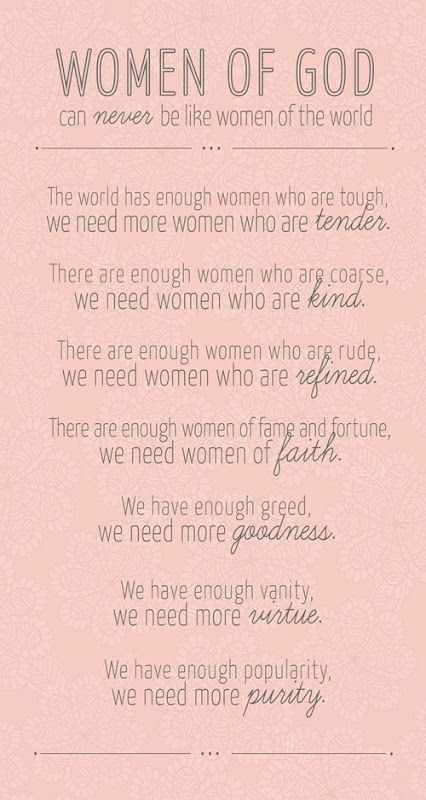 All through Scripture, God has brought Women out to Speak His Word, yet the World continues to push women down. It's not about Equality anywhere, it's about the Call in Women's Lives to be what they have been called to do! Kingdom Worthy. Search the Word of God for yourself and see that God calls Women to be Great, to be teachers which Pastors are. 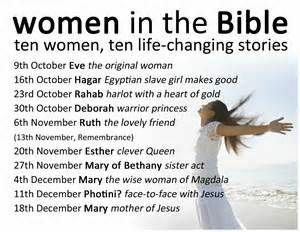 There are so many more Women from the Bible. Take a study look here and find them, then choose for yourself without some denominations word of what God does through and with Women. He never, ever oppresses them. "Biographical study convinces one that Scripture was not given merely to satisfy the intellect, but to enrich one’s own life, to quicken the conscience, correct judgment, reinforce the will and direct the feet. Allowing for differences of time and place, the temptations and possibilities coming to Bible women meet the daughters of Eve today. Their God is the God of modern women, who have a spiritual armory Bible saints did not possess. Women on this side of the cross and of Pentecost need not know shame and defeat in life. 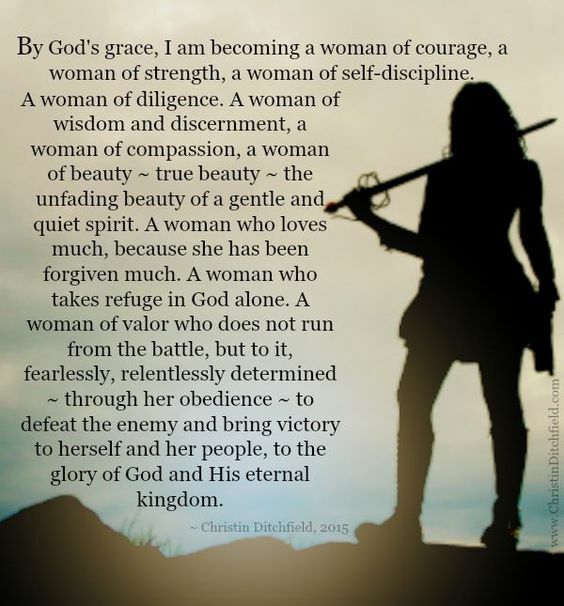 Christianity has supplied women with a full emancipation."